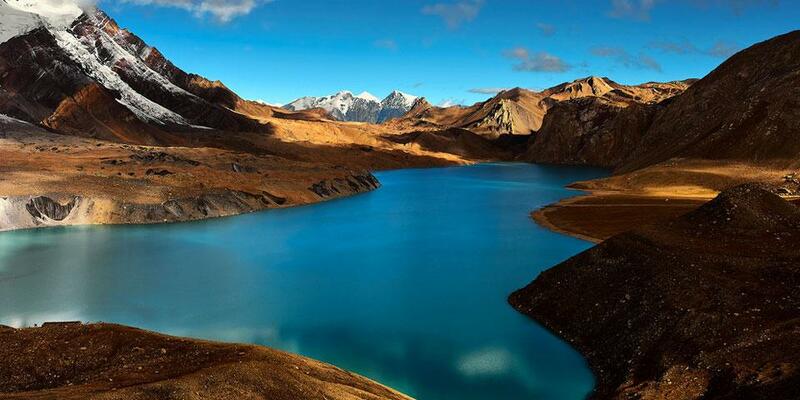 Annapurna Circuit with Tilicho Lake Trek takes us to the world’s highest lake in the Manang District of Nepal. This “classic” journey of Annapurna Circuit with Tilicho Lake Trek starts with a drive to Bensisahar in the lowland paddy fields, steadily gaining altitude leading up the Marshyangdi River Valley, passing through oak and pine forests, and eventually emerging into high desert country at Manang (3597 m.) through the villages of Chamje and Bagarchap Pisang to cross the Thorung La Pass (5416 m). The descent is equally amazing and varied. The trail switches over to the Kali Gandaki River valley and descends through the villages of Muktinath, Jomsom, and Ghorepani to end in Pokhara, giving you enough time to observe the people and their customs. Lowland farming communities of Brahmin and Chettri people of Aryan stock give way, slowly, to the highland trading communities of Magar, Gurung and Bhotia people of Mongoloid stock. As the people change, so does the dominant religion. Close up views of the Annapurna range, varied ecosystems, diverse cultures and an ever-changing landscape – lush, green paddy fields and oak forests, arid deserts and the deepest gorge in the world make this one of the most popular treks in the world. Day 01: Arrival in Kathamdu 1350m/4428ft. Upon your arrival at Tribhuvan International airport, You will be welcomed by the Tibet Holidays airport representative and transferred to your hotel. Day 02: Kathamandu valley world heritage sightseeing. After breakfast proceed for Full day sightseeing of Kathmandu valley will be commenced today. Covering places such as Monkey Temple overlooking Kathmandu valley, Darbar Square with the Kumari house, Patan with Krishna temple along with ancient art & architechture the after Bhaktapur the city of devotee dominated by 55 windowed palace & the Taleju temple, evening back to hotel. Day 03: Drive from Kathmandu to Besishar 800m/2755ft- 7hrs by Bus. About 176km from Kathmandu to Besishar. 6/7 hrs scenic drive through Trishuli and Marsyangdi however, the bus will be stopping on the way for the lunch and toilets, it’s a day that we could explore some point in Besishar and prepare for the next day trip to Chame. Day 04: Drive to Chame (2670m- 5 hrs) by jeep. Drive to Chame, we will take a jeep from Besishar to Chame, today’s our drive follows Marsyangdhi valley crossing few topical mountain villages and worth green valley. Its outstanding view on the backdrop with Majestic Mountain views and follows gently up on the bumpy road. Day 05: Trek to Pissang 3310m/10856ft- 4/5hrs. Day 06: Trek to Manang 3450m/11316ft- 5/6hrs. Today you will leave the greeneries behind as you trek along uphill with more scenic and magnificent views. After crossing the river you will climb switch-back up to Gyaru, where you will get the massive Mountain views down the valley. 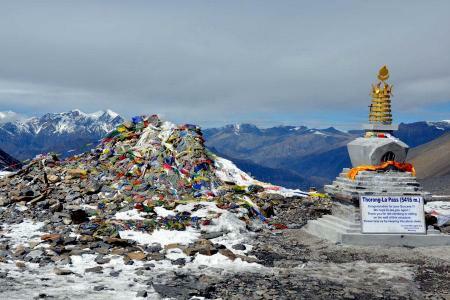 The trek follows continues with more scenic views until you reach the typical Tibetan style village Ngawal. After lunch descending and level walk brings you to Munji. From here it’s an easy hour walk through to the village Manang. Today we have Acclimatization day in Manang. Depending on your interest we decide on what you really want to do... an easy and short hike. Crossing the river and walking uphill overlooking the beautiful Gangapurna Glacier lake, climbing further up to the viewpoint at the ridge where you see the Gangapurna glacier and the picturesque Manang village. This trip will take 3/4 hrs round trip to breathtaking areas. You climb up through the buckwheat cultivation on the rough trail to the small monastery, reaching the top. From here you get a superb view of the Annapurna range, Tilicho peak, Gangapurna with Manang valley. You then descend to Manang. Day 08: Trek to Siri Kharka 40650m/13,325ft - 4/ 5 hrs. After having our breakfast at Hotel, our trek will be started, we climb little up after crossing the Manang village than we follow the upper route which descends after few steps up to Riverside then we cross a suspension bridge and walk through pine trees and after few hours walking on beautiful place we arrive at Khangsar village which is inhabitant by Tibetan people, we take a lunch break and after that we continue an hour trek to Shiri Kharka. After Breakfast, we follow the easy path that leads through the middle of the landslides area where we can view impressive rock formations we trek up till Tilicho base camp where we can get a good view of Tilicho Peak and other surrounding snow peaks. Today we start early day hiking to Tilicho Lake after having breakfast at the lodge. we climb gradually up to reach Tilicho lake, which is the highest lake in the world, It lies on the bottom of the surrounding 360' Mountain views. its one of the spectacular lakes and very impressive. we descend after enjoying the beautiful scenery and mind-blowing view. Today we descend to the Khangsar village, passing beautiful ancients monasteries and gumba, we across a river, hike up to a plateau to reach yak kharka. 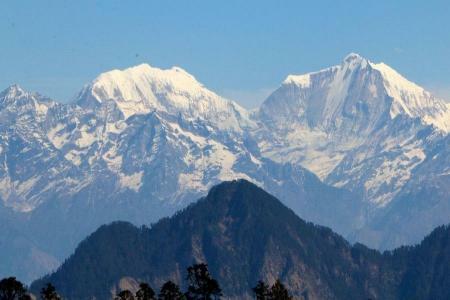 This is the best point to stay and see the magnificent Annapurna, Gangapurna ranges. Day 12: Trek to Thorang Phedi 4420m/14501 ft - 3/4 hrs. 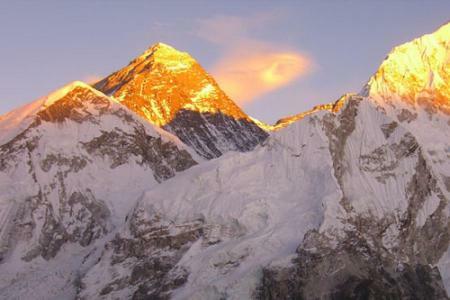 Today you will see the awesome sunshine view from the way over the Legendary Himalaya's. The trail goes gradually up onto Through Phedi, the yak pasture to Ledar and continuing on the level trail on the scrub, crossing the river and then you will reach as Phedi. Today is the long day and tough day in our journey. Trek starts very early in the morning. The trail is much uphill, climbing up passing the first tea shop, continuing on rough ground or on the snow-covered ground all the way to top (5416m). At the top, there is a Buddhist flag and tea shop where you will get hot drinks. Walking 20m further up you will see the frozen ice lake at bottom of the Through peak. From here the trail descends steeply down 4hrs with a magnificent view of Mt. Dhaulagiri and other mountains with Kaligandaki valley to Muktinath, where you can visit the Vishnu temple, monastery108 water tap and natural burning gas. Today we take a jeep to Tatopani crossing beautiful villages such as Jomsom, Marpha, Kalopani, and Tukuche. After breakfast, we ascend to Ghorepani walking through villages of Sikha and Chitre, as we walking through a terraced farmland we will be able to see the beautiful with mountains all around us to Ghorepani. Today the trail descends crossing the suspension and short trek goes to along the Modi river From Kyumi the trail still ascends gradually through the passing villages after a short walk to Nayapul seems like your trekking done, then you will ride a car to get Pokhara. After finishing your remarkable trip in mountain now time for having some western food in Pokhara and have a good shower here.Overnight at guesthouse. As today is the last day of the trek there will be having a farewell dinner with the trekking crew. 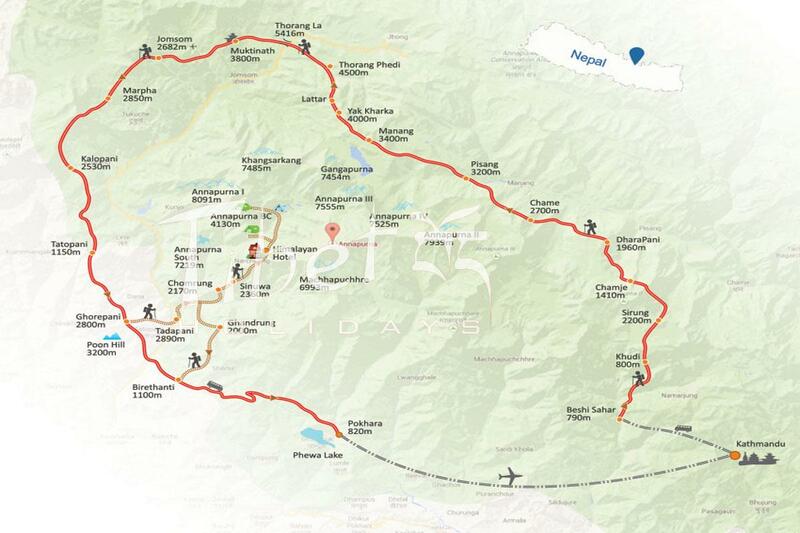 A scenic drive from Pokhara to Kathmandu will take 7hrs or in optional you could fly from Pokhara to Kathmandu. At Kathmandu, you will have free time for shopping souvenirs for family and friends. Free until airport reporting time; either walk around market or do some shopping. After that you will transfered to airport to connect your flight to home. International and domestic Airport pick-up and drop by car. Kathmandu-Besishar- Chame, Muktinath- Tatopani, and Nayapul - Pokhara-Kathmandu by local bus.